On August 29, my dad and I jumped in the car and traveled two and a half hours to see Philadelphia Union play against D.C United at Audi Field. Some people thought we were crazy to travel that distance to see an away game. This trip made me think about what it takes to be a fan of the Union and why it is worthwhile to make these trips every now and then. As a lover of soccer, it is cool to see different stadiums, especially a new one like Audi Field. There is different food, merchandise, traditions, and songs. I once went to see NYCFC at Yankee Stadium. It was weird because it was a baseball field. There were no activities beforehand, although we did get to meet the New York players after the game. We won an opportunity to get Andre Pirlo’s, Frank Lampard’s, and David Villa’s signatures. I hid my Union hat. Even though they were not the Union, it was still cool, because they are all legends. The Union lost that day. Another time, I went to RFK Stadium to see D.C. United play. It was old and worn down. There were even seats missing. It was the old Washington Redskin’s stadium. I do remember that they had good empanadas and the best lemonade I’ve ever had at a stadium. Again, the Union lost that day. From these experiences I am so thankful that we have Talen Energy Stadium. It is so clean. It is well-landscaped. They have activities to do outside, and they have a variety of food that people want, like Chickie’s and Pete’s Fries. I only wish that they served freshly squeezed lemonade. It one thing to cheer on your team at a home game surrounded by fellow Union fans and another to be one of the few Union fans in a hostile environment. 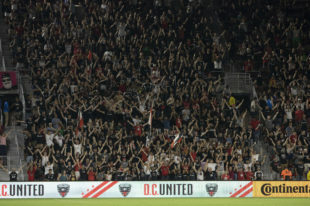 It felt great to stand alone at Audi Field by the railing holding up my Union scarf rallying my team during their warm-up period. I’m not sure if anyone on the team saw me, but I hope that it encouraged the Boys in Blue. Teams need to win both at home and away. It was nice to bring a little “home” to Audi Field. I know that sometimes you go to an away game and the team does not win. Although I could not go to the U.S. Open Cup game in Houston, over 500 Union fans went. The result was not what anybody would have hoped for, but the team must have appreciated the fan support. In the future, I want to go to more stadiums, including the Red Bull Arena, which is close by. I also want to go to stadiums that are farther away like Atlanta United’s Mercedes Benz Stadium and Vancouver’s BC Place because they both have roofs that can be closed inward. That would have been useful last week when the Union played Sporting Kansas City. If they make the playoffs, I’ll go wherever it is! When I was younger, I would sometimes get annoyed when visiting fans would come to Talen Energy Stadium in their teams’ jerseys cheering for their teams and often jeering the Union. Now I appreciate that they are there. I particularly like the Rivalry games against NYCFC, New York Red Bulls, and D.C. United when there are a lot of away fans. I still want the Union to win and the other fans’ teams to lose, but I respect any away fan who is willing to travel the distance, proudly wear their team’s jerseys, and root loudly behind enemy lines. Ben, going to see as many away games as I can is my goal too. I was at that NYCFC game with you, though I didn’t get to meet Pirlo. He’s my hero. Always impressed with your work Ben! Great read. I have not made it to any away games yet but plan to so soon. Keep up the great work! Nice work Ben. If you’re a USA soccer fan (men or women), I would recommend traveling to attend one of the friendlies they have around the US. Especially when they are facing Latin American teams and most especially when facing Mexico. Depending on the location you’d be surprised how evenly matched the crowd size is, with the visiting fans sometimes outnumbering the US fans. The atmosphere is typically loud and festive but without the fighting, bullying, and overall nastiness you’ll find at an American Football game. Keep up the great writing. Many of us that frequent this site point out how the game and the team do right or wrong by the kids that come to see them. It’s nice to see your perspective. Great read Benjamin! Keep your home team spirit alive! I LOVE this! Traveling to another stadium as a foreign fan makes us understand and appreciate the foreign fans that come to our home field. Isn’t this the gift of travel? Bravo to you and your dad for being such awesome fans and allowing these « field trips » to open your hearts and minds.